Breast cancer touches lives every day. As professionals in an industry that provides refuge, healing and renewal, we have a unique opportunity to serve women who are fighting cancer. In this month's Dayspa magazine (http://www.dayspamagazine.com/), Andrea Moret writes about ways some spas have chosen to raise awareness and cater to clients' physical and emotional needs. 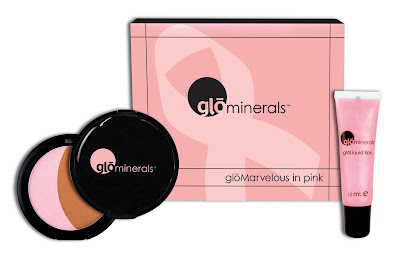 At gloProfessional, we are joining the National Breast Cancer Foundation in its mission to extend women's lives through education about breast cancer and early detection with our 2009 glominerals gloMarvelous in pink kit. We're dedicated to helping every woman find radiance that shines from within by treating the complexion, body and spirit. This October is an opportunity to do just that in a very special way!